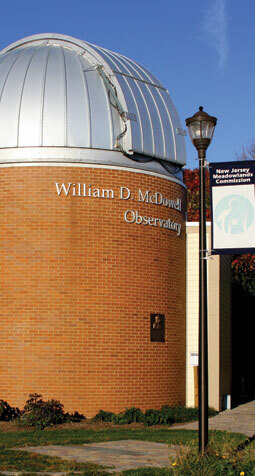 The McDowell Observatory is Temporarily Closed for Maintenance. The state-of-the-art Observatory features a research-grade, Classical-Cassegrain telescope housed within a six-meter retractable dome with a 20-inch mirror and is capable of viewing objects millions of light years away. The Observatory is operated by astronomers from Bergen Community College. The telescope has several special filters designed to help minimize the effects of the area’s light pollution. The precision instrument also includes specialized cameras to photograph various astronomical objects, a photometer to measure the brightness of stars and study how they vary over time, and a spectroscope to analyze wavelengths of light to determine the chemical composition of light-emitting objects. All ages are welcome and children must be accompanied by an adult. Twenty-five people may occupy the Observatory at any one time. Entry is on a first-come, first-serve basis. Check-in at the Science Center adjacent to the Observatory. Note: To access the observatory telescope, a visitor must be able to climb 25 steps in spiral formation. The stairs have railings on either side, approximately 2 feet apart.